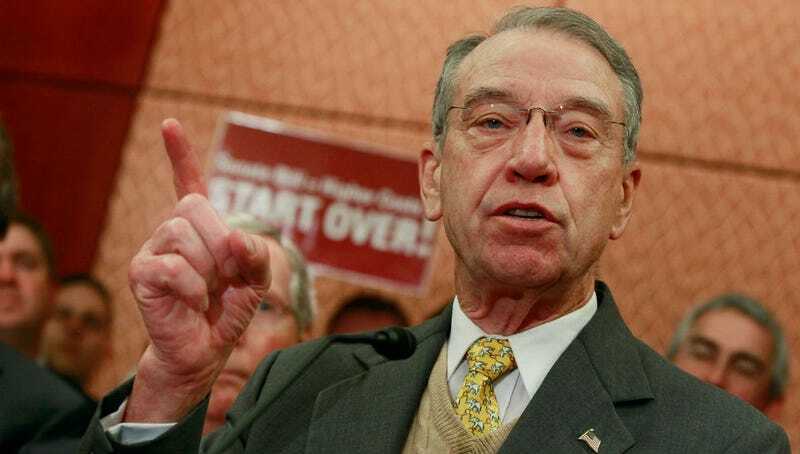 This is Chuck Grassley, a Republican United States Senator from Iowa. (Everyone say "Hi Chuck!") On Monday, he turned the Internet from a temporary repository for people to freak out about teenagers who work in retail to a den of speculation and—dare I say—wonder. According to Business Insider, this was all just a bunch of horny, drunk people on the Internet reading too much into things aka a " misunderstanding:"
However, Grassley's spokeswoman told Business Insider the senator was most likely referring to eating the company's blended "Blizzard" sundaes. "I presume he means ice cream or maybe more specifically, a Blizzard," she said, attaching a photo of the Grassley enjoying some Dairy Queen ice cream. To stare into the dark void of a Snickers Blizzard and reconsider all of your life choices. Sitting in the parking lot and thinking up more dumb things you can say about President Obama. Hanging out with Rick Perry. Thanking God that you never actually endorsed Rick Perry that time he ran for president. Tacos (STAY WITH ME ON THIS, PEOPLE). Have you ever been out with your friends and they want to go to Dairy Queen but you're feeling like tacos. With the DQ, you don't have to compromise. And their tacos are not that bad. There, I said it. Team Dairy Queen Tacos FOREVER. Don't forget to vote tomorrow, everyone!